The Winds of War is a 1983 miniseries, directed and produced by Dan Curtis, that follows the book of the same name written by Herman Wouk. Just as in the book, in addition to the lives of the Henry and Jastrow families, much time in the miniseries is devoted to the major global events of this period. Adolf Hitler and the German General Staff, with the fictitious general Armin von Roon as a major character, is a prominent subplot of the miniseries. The Winds of War also includes segments of documentary footage, narrated by William Woodson, to explain major events and important characters. It was followed by a sequel, War and Remembrance, in 1988, also based on a novel written by Wouk and also directed and produced by Curtis. The film follows the plot of Wouk's novel closely, depicting events from March 1939 until the entry of the United States into World War II in December 1941. It tells the story of Victor "Pug" Henry, and his family, and their relationships with a mixture of real people and fictional characters. Henry is a Naval Officer and friend of President Franklin Delano Roosevelt. Author Herman Wouk was very negative and skeptical about a motion picture adaptation of his beloved, and scrupulously researched, novel, since he was most displeased with several earlier adaptations of his novels. But in 1983, The Winds of War eventually became a successful mini-series, co-produced by Paramount Pictures and the ABC television network, on which it aired, and directed by Dan Curtis. I, Claudius screenwriter Jack Pulman was originally hired to adapt the novel, and he and Wouk worked together for months preparing an outline. After Pulman passed away suddenly in 1979, Wouk himself wrote the teleplay for the series. Wouk had considerable influence on the production itself, and gave detailed instructions on what, and how many, commercials would be allowed. Wouk also has a cameo as the archbishop of Siena. The 962-page script contained 1785 scenes and 285 speaking parts. The production involved 4,000 camera setups and shot a million feet of exposed film. The estimated budget was very large for its time, $38 million ($120 million in 2017 dollars). The production had a 206-day shooting schedule and came in four days ahead of schedule. The series was shot at 404 locations in Europe, California and Washington state over a 14-month schedule. Principal photography began on December 1, 1980 aboard the RMS Queen Mary in Long Beach, California and was completed (except for miniature photography) on December 8, 1981, on US Navy vessels at Port Hueneme, California, with filming of the recreation of the Attack on Pearl Harbor. Principal locations were Zagreb, Opatija and Rijeka in Yugoslavia; Berchtesgaden and Munich in West Germany; Siena, Florence, Milan and Rome, Italy; London, UK; Vienna, Austria; Naval Station Bremerton in Bremerton, Washington; and throughout the Los Angeles area and Southern California. Scenes were filmed onboard the USS Peleliu (LHA-5) and the USS Missouri (BB-63) the latter still in mothballs. 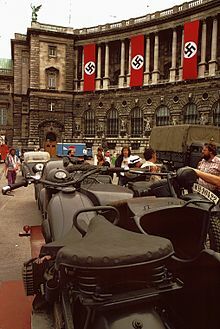 The opening scene sub-titled "Berlin" was actually filmed in and around the Hofburg in Vienna. The casting of Lee Strasberg as Aaron Jastrow was publicly announced in February 1981. Strasberg had to withdraw from the production before filming any scenes, due to ill health (he died in 1982). He was replaced by John Houseman. Houseman later had to withdraw from the sequel miniseries, War and Remembrance, due to his own ill health (he died in 1988). Houseman was replaced by John Gielgud. The Paramount production made use of battle scenes from other films during the attack scene on Pearl Harbor and during the German attacks on the Soviet Union, including scenes for both battles from Tora! Tora! Tora! The OpsRoom at RAF Uxbridge, from which the Battle of Britain fighter defenses were commanded, is only rarely made available to the public. Such producers as Dan Curtis managed to get permission to film there. The music was composed by Robert "Bob" Cobert, a composer often associated with Curtis. Nazi concentration camp-survivor Branko Lustig was an associate producer in the miniseries, and also on Schindler's List. The almost 15-hour-long series was shown by ABC in seven parts over seven evenings, between February 6 and February 13, 1983, and attracted an average of 80 million viewers per night. The show was a success throughout the United States and received many accolades, including Golden Globe nominations and various Emmy wins and nominations. ^ The Winds of War, DVD-featurette. ^ a b c d "ABC-TV, Paramount Studio go with 'Winds of War'". The Town Talk from Alexandria, Louisiana. February 5, 1983. p. 30. ^ AP. "DISNEY SHOWS TO APPEAR ON CBS-TV NEXT SEASON". ^ "Observer-Reporter - Google News Archive Search". news.google.com. Wikimedia Commons has media related to The Winds of War (TV miniseries). This page was last edited on 16 April 2019, at 21:11 (UTC).